Fictionalised re-enactment of events leading to the infamous 2009 Fruitvale Station shooting. In the early hours of New Years Day 2009, 22 year old Oscar Grant (Jordan) was shot in the back without provocation by Johannes Mehserle (Murray), a member of San Francisco's Bay Area Rapid Transport (BART) police force, later dying in hospital as a result of his wounds. Occurring in a crowded train station, the incident was recorded by several members of the public on cellphones. Ryan Coogler's feature debut opens with one of these clips, cutting just at the moment the gunshot is fired. It's a tough act to follow, and Coogler is only mildly successful in doing so. The film reimagines the roughly 24 hour period of Grant's final day in an attempt to put a human face to the tragedy, but the character is represented here with little nuance. The real life Grant had a history of drug dealing so Coogler decides in his take on the story that this is the day he decides to stop dealing drugs and attempts to go straight. Grant is shown for the most part as a too good to be true type, attending his mother's (Spencer) birthday when none of his other siblings bother to, paying his sisters rent, helping out strangers in the supermarket, attempting to save a dog after it is run over by a speeding car, and paying for a BART ticket when his friends merely jump the turnstile. The only dark side to his character is glimpsed in two interactions with Hispanic men, whom he makes veiled threats to, and an angry exchange with a white inmate during a flashback to one of Grant's prison stint. If the implication is that Coogler is himself racist, it's an odd one, as his girlfriend (Diaz), the mother of his four year old daughter, is herself Mexican. Like the awful 2004 Oscar winner Crash, almost every character here seems to be bigoted to some degree; Grant's sister demands that the birthday card he buys for his mother not feature any white people, an Uncle professes to support a football team because of their predominantly black staff, and a white man has a friendly exchange with Grant but refuses to make eye contact with him. Coogler is determined to make his leading man a likeable one, a decision that clouds the issue at hand here. Mehserle's actions were wrong, regardless of whether Grant was a saint or a sinner. It shouldn't take an angelic portrayal of Grant to make the audience realise this. 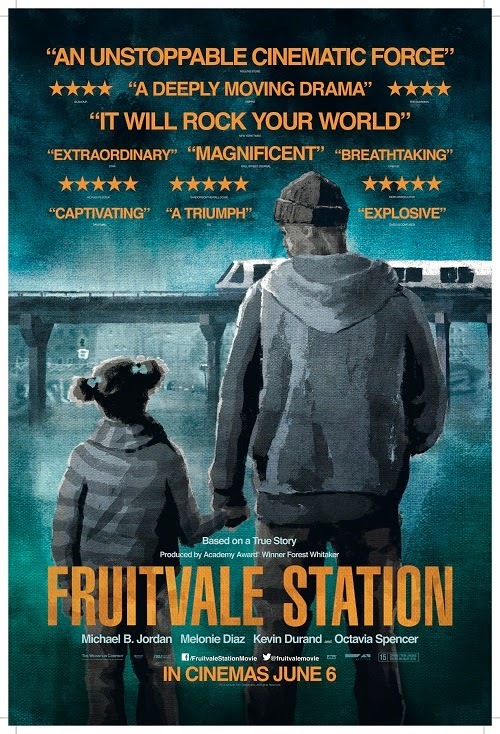 Despite its cliched and nuance free script, Fruitvale Station ultimately succeeds due to a trio of central performances from Jordan, Diaz and Spencer that are anything but cliched. If the movie truly highlights an issue of race in contemporary America, it's how few good roles there are for minority performers in American cinema.